Conveniently located at the corner of Harmony and Timberline in the Harmony Medical Center Campus. 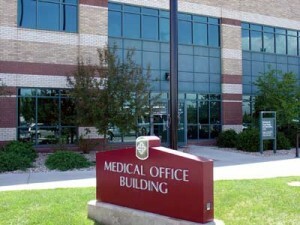 Our office entrance is located just adjacent to the main entrance to the campus. For a list of phone extensions, please click here. ** PLEASE do not send prescription refill requests, appointment requests, or any personal health information through this portal. This is for general inquiries. To e-mail our office, please sign up for a My Health Connection account at myhealthconnection.uchealth.org. Medication issues, medical inquiries, and appointment requests will not be answered through this system. You will need to contact the office directly. Please contact your pharmacy for refill requests.